12V USB adapters are both convenient and versatile, but make sure you buy the right one. Finding the best 12V USB adapter to buy can be a dicey matter, since you have to consider the size of the plug, the output voltage, and the output amperage range in order to find the right one. Historically, having two devices that were both made by the same manufacturer hasn’t even come with any guarantee that the power supply for one will work with the other. This was traditionally a huge problem with the cell phone industry, and a drawer full of outdated wall warts and 12V car adapters is something that a lot of people are all too familiar with. Of course, that all changed when various companies started to adopt 12V USB adapters as a de facto standard. Today, it's possible to power or charge just about any mobile device, including cell phones, tablets, and even GPS units, with the right 12V USB adapter. Unfortunately, the key word there is right, because there's definitely such a thing as the wrong 12V USB adapter. When you think about 12V USB adapters, and the mess of non-standard plugs and adapters they replaced, the first thing you probably think about is the plug itself. That’s the great thing about USB, after all. Whether you’re looking at standard USB, mini USB, or micro USB, the standard specifies that they have all of the same basic terminal connections that serve the same basic functions. You can even use an adapter to go from micro USB to mini USB, or vice versa, if you need to. However, the USB standard conveys another advantage that helps explain why USB made its way into our cars: standardized voltage outputs. Since USB connections put out 5v DC, devices that use this type of adapter are all designed to run on that voltage input. You can’t get any simpler than that, and that removes a huge part of the headache traditionally associated with finding the right 12V DC adapter. Of course, voltage isn’t the same story, and not every device manufacturer plays by the same rules. With that in mind, there are few other considerations that you need to keep in mind when looking for the right 12V USB adapter for your device. Some 12V USB adapters include a built-in USB cable. If you want to buy this type of adapter, then it is vital to choose one that has the right type of connector. Look at your phone, or other device, to see what type of connection it has, then look at the chart pictured above, and select a 12V USB adapter that has a connector that matches. Universal USB chargers can be used with any high quality USB cable. When you purchase a universal 12V USB adapter, you will find that it has a standard USB type A socket, which will look like the socket pictured in the top left of the above illustration. If you buy a universal 12V USB adapter, you will also need to buy a compatible cable to go with it. Look for a cable that has a USB type A connector, pictured in the top left of the above illustration, on one end. The other end should match the charging socket on your phone, and will typically look like the USB-C, USB mini, or USB micro connectors pictured above. While some devices require more amperage than others to charge and operate with a 12V USB adapter, it doesn’t really become an issue until you start getting into Apple devices. The issue here is that Apple devices use a different method to “know” whether they’re plugged into a high amperage “charging port” (or, say, a 12V USB car adapter) than Android devices and just about anything else. If you have an Apple device that you want to use with a 12V USB adapter, then you need to look for one that’s specifically marketed for Apple devices. 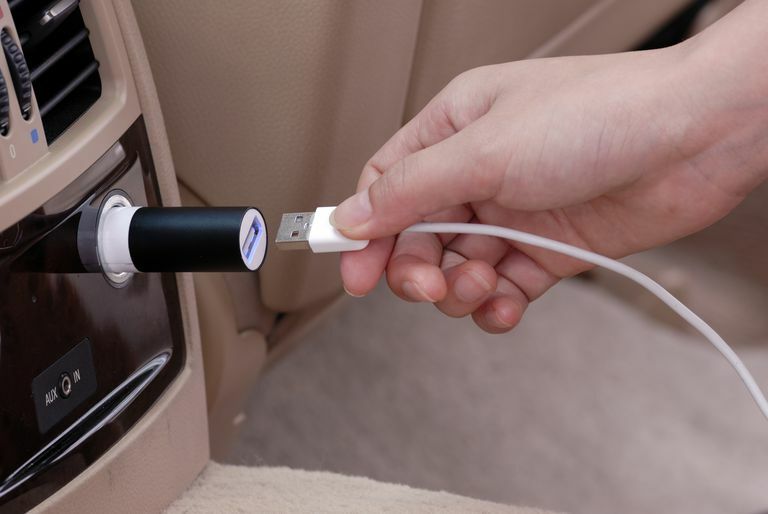 While you can find USB car adapters that are specifically designed for Apple, there are also adapters that have two USB ports — one for Apple and one for Android and other devices. If you use a mix of Apple and other devices, or you often have passengers that don't use Apple devices, one of these multi-purpose 12V USB adapters is a great choice. While your Apple device will probably charge on just about any 12V USB adapter, you may need to turn the screen off, or power it down entirely, in order to keep the power needs of the device from outstripping its ability to draw power from the adapter. USB is pretty near on to universal these days, but 12V USB adapters rely on another ubiquitous technology to work: the 12V accessory socket. If you've never used a 12V USB adapter, you may be wondering if you can plug one into a cigarette lighter, or if you need a dedicated accessory socket, and the answer is that it doesn't really matter. The difference between accessory sockets and cigarette lighters is basically just that you can't plug a cigarette lighter into an accessory socket. As long as the socket itself isn't damaged in some way, you can use your 12V USB adapter in either one. Is it Just a Cigarette Lighter or a Power Socket? Why Doesn't My 12v Socket Work? Is There a Difference Between a Cigarette Lighter and an Accessory Socket? How to Choose an Alternator: Do You Need a High Output Alternator?